Jake and I raised the Christmas tree from it's stuffy prison in the closet last night. We just couldn't wait anymore, and since it was the first day of snow, it felt okay. For most of my life, I've watched, "A Muppet's Christmas Carol" while trimming the tree, but the last two years in a row now, it's been, "Empire Strikes Back". I think, because of it's Hoth-set beginning, it feels very seasonal. At any rate, it was an accident. Half-way through yesterday, Jake said, "Wait a minute, we did this exact same thing last year!" Lo (bot) and behold, he was right. So we're just going to go with it, and make it our official Christmas decorating film. We won't be putting up ornaments or any of the other Christmas artifacts until after Thanksgiving, that way it will be a couple more weeks until it looks like Santa threw up in our house. Jake: "I would give my right pinky toe to have played Rogue 2/Lobot/any other bit part in the movie." Me: "I wish I could wear my hair like Leia's, but it never stays!" Jake tells me random facts about the production the whole way through the movie (which may or may not be true) and we inevitably argue about which scenes have, in fact, been retouched. Funny thing about Geeks in love, you'd think we would get tired of talking about the same things over and over again...but we don't. It's our own special brand of holiday sentimentality. Now...to track down the Star Wars Holiday Christmas Special. 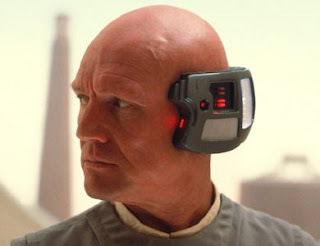 For the record, I think Jake would've made an excellent Lobot.